Here's one of the Mothers Day Card Designs I have been wanting to show you. VIcki Hodgman of Cards on the Table with Vicki made a similar card and I was so taken with the idea, it stuck in my head. Here's how I made my own version. 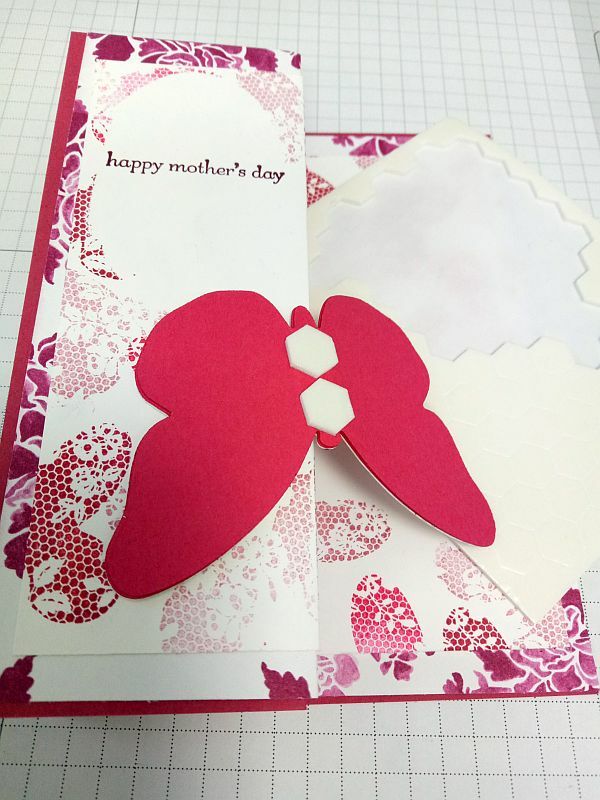 Below I show you step-by-step how I made my own special butterfly card. Vicki made her card in lovely shades of blue for a birthday, I believe, so Mothers Day Card Designs will work when making other special occasion cards as well. NOTE: Measurements have been UPDATED. Sorry for the incorrect ones that were first published!! A standard plain cardstock card base (21cm x 14.5cm or 5.75" x 8.25") folded in portrait style, and the front is scored at 5.25cm (2.25"). I used Melon Mambo for mine. A piece of designer series paper measuring 1/2cm (1/4") smaller than your card base, so 20.5cm x 14cm or 8" x 5.5". Here I used some Berry Bliss from the In Colors designer series paper stack for 2017/2018. Test it out against your card base to make sure it fits the way you want it to. Trim further if necessary. Fold it in half portrait style. A piece of Whisper White cardstock measuring 20cm x 13.5cm ( 7.25" x 5.25"). You can trim this down if you want more of the designer series paper to show. Fold it in half portrait style. The Bold Butterfly open framelit and one of the Layering Ovals framelits to match the size of your sentiments. 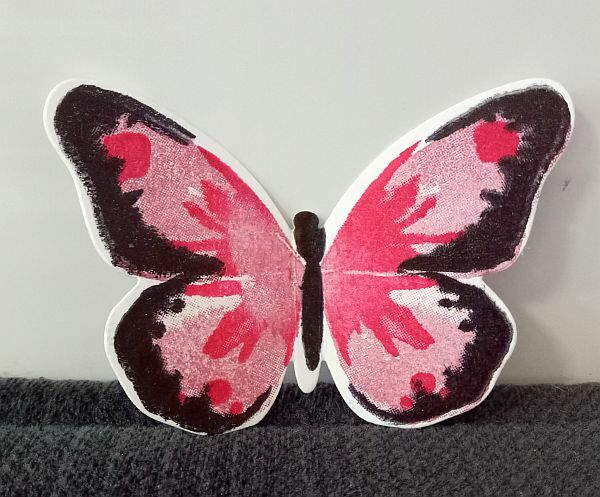 Spare Whisper White and Melon Mambo cardstock for stamping and cutting out butterflies. You need one cut from the Whisper White and two from Melon Mambo. Basic Black, Sweet Sugarplum, Flirty Flamingo and Rose Red inks and some stamping blocks. Teeny Tiny Sentiments, Butterfly Basics and Watercolor Wings stamp sets. Clear Wink of Stella brush pen. Adhesive. I chose Tombow Multi Liquid Glue. First score the fronts of the card stock base, designer series paper and Whisper White cardstock layers in half. You want them all to layer together and frame each other. IMPORTANT: You will see from the above photo that I also stamped my sentiments on my whisper White. 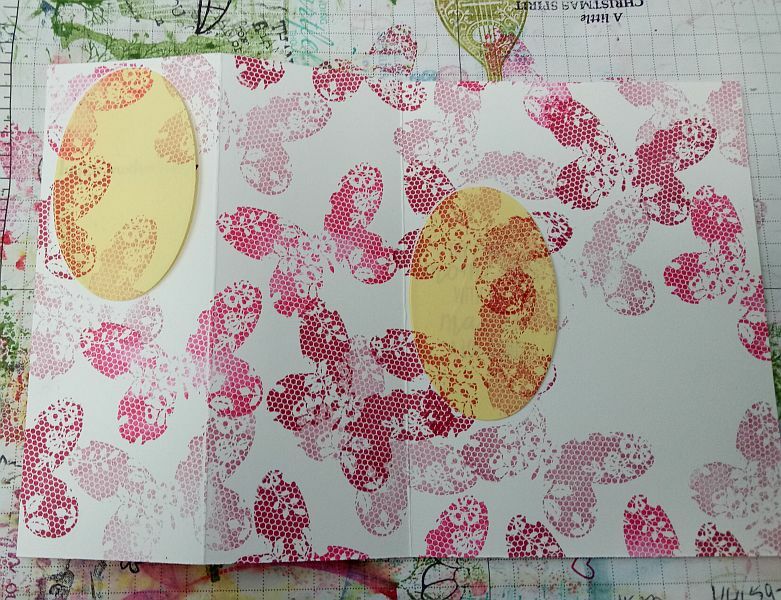 Do all stamping before you adhere the layers together so you can stamp when your cardstock is completely flat. I also stamp my Angel Policy stamp on the back of my card base before I put my layers together, so I don't get ridges in my stamped images. While I have my stamps and ink out, I usually stamp my envelope up as well. You aren't done stamping yet though! Take the Whisper White layer. Cut out two oval shapes from Post-It notes, getting as much of the sticky bit into your oval as possible. 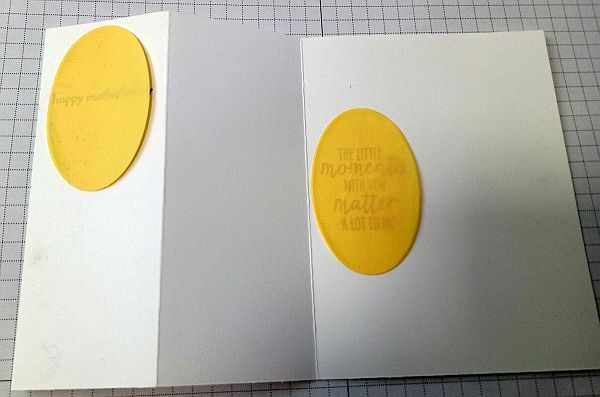 Use the Layering Ovals framelits to cut out the Post-It note ovals. We're going to use these to help with the masking technique. NOTE: I left some room blank so I could write a message on my card, just to the right of the inside sentiment. This time choose Flirty Flamingo ink and, using the same image, fill in some of the white space with more butterfly images It won't matter if some of the images overlap a bit. Again, make sure some of the butterflies help frame the sentiments by stamping over the Post-It note edges. 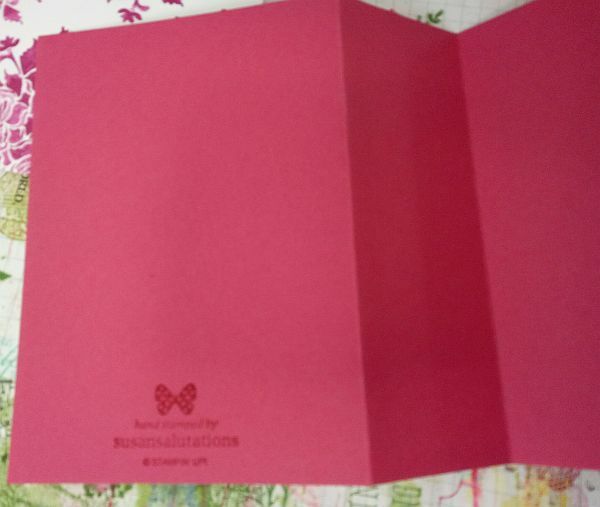 Now you can fill in any other parts you want filled with the Rose Red ink and your butterfly stamp. 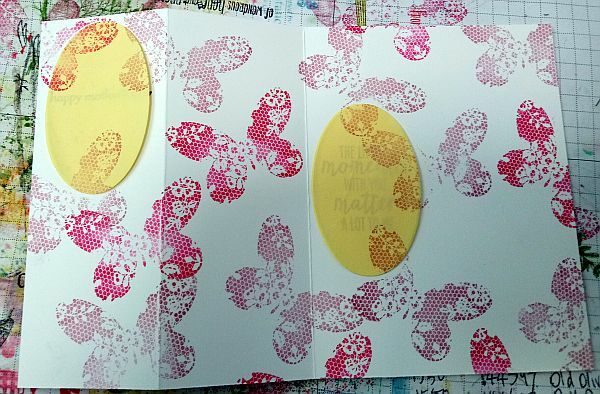 Keep stamping till you are happy with how the card layer looks. When you have finished stamping the layers, use your Tombow glue to adhere the layers together by gluing down just the end pieces of each layer. Before the glue is dry, close your card and smooth it out, to make sure the layers fit well together. Leaving the glue on the ends of each layer instead of trying to glue all the layers down in the middle ensure you have some play between the pieces, and they will close better for you. This card has three layers so it becomes quite thick to fold. I always reinforce my scored lines with my bone folder several times to make sure they all lie as flat as possible. I even put this card inside a heavy hard-covered book, under a heavy 15 litre water container for awhile so it would close flatter. Score the butterfly along both sides of the body so the wings can fold up. 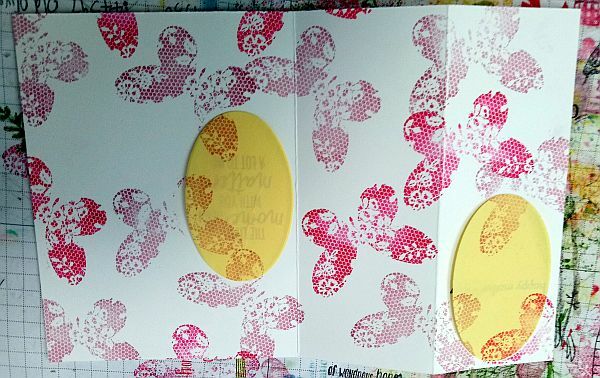 Now cut two more butterfly shapes form the Melon Mambo cardstock and score them along the bodies too. Then layer all three cut outs together with Tombow glue, making sure they match up. 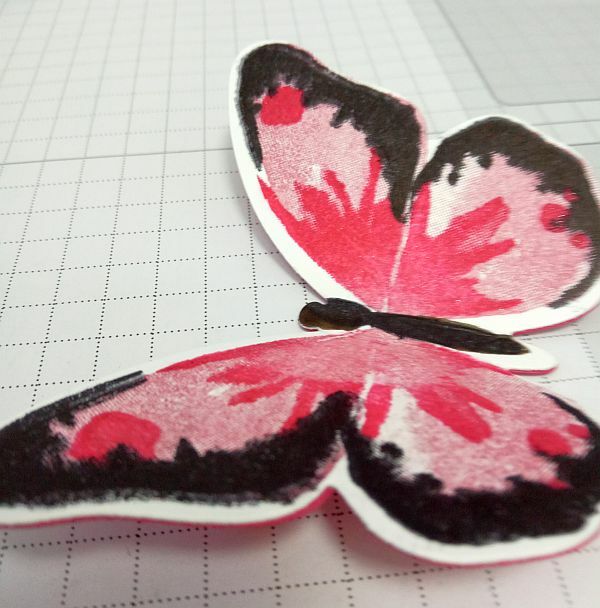 After that, add some Stampin' Dimensionals to the back of the butterfly's body. 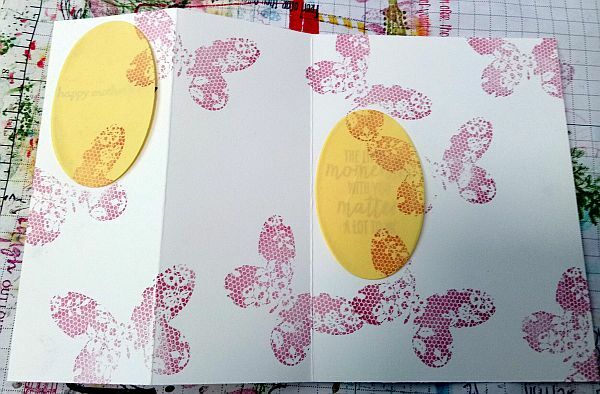 Position it on the inside of the card so it overlaps the folded front. 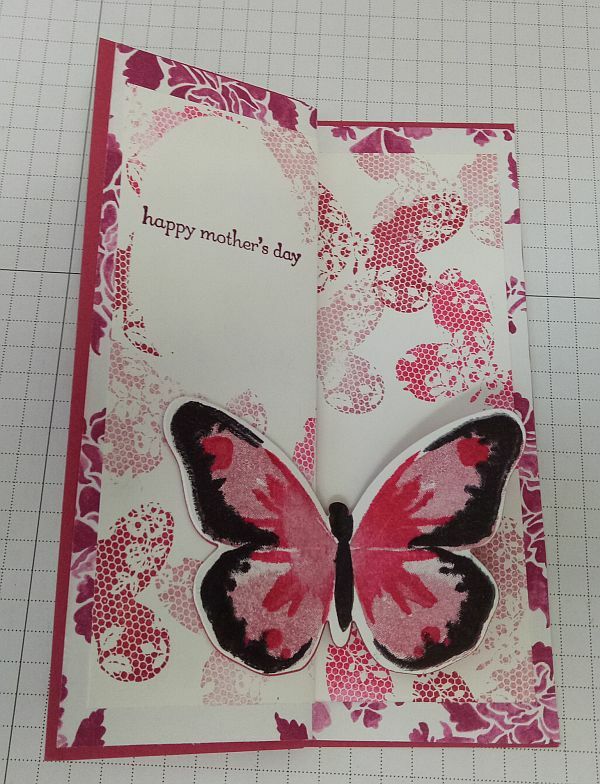 Now you have completed all the Mothers Day Card Designs steps. Your card is done! If you have Mothers Day Card Designs you would like to share, feel free to add them below. PS: This is also where you can submit your own card closure design for the competition mentioned in Paper Twist Issue No 23. Deadline for submissions is May 6th, 2018. If you have not yet subscribed to Paper Twists, do so now and join the fun! 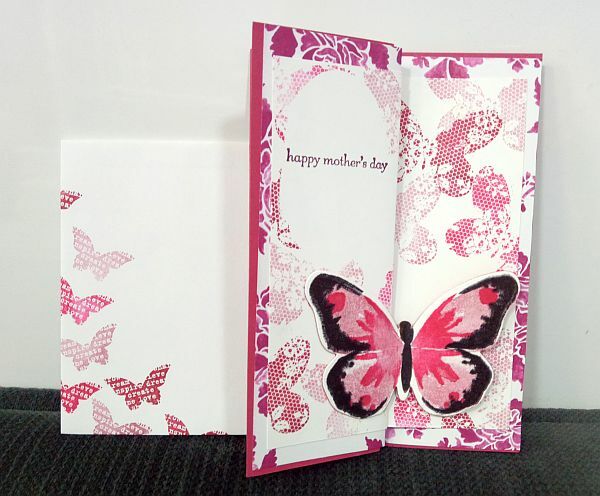 You can see many other Mothers Day Card Designs on the Cards for Troops pages.